EatSmart is paving the way to better fitness. 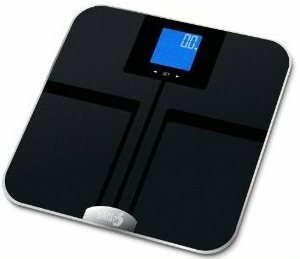 Their Precision GetFit Digital Body Fat Bathroom Scale is light years ahead of ordinary bathroom scales with all the important health measurements it can read besides calculating weight. I am still amazed at what this compact machine that I was sent for this review and giveaway does every time I step on it. Simply put, this scale uses bio-electrical impedance analysis technology to determine your body fitness when you input your information such as gender, height, age, activity level and your weight. Though complicated sounding, this scale is easy to operate. You weigh yourself first thing in the morning, preferably in bare feet. You can keep your socks and shoes on, but this will only show your weight. Later in the evening before dinner, step on that scale again without socks. It will calculate body fat, total body water (about 45-65 percent of your total body weight), muscle mass (which is usually between 25-75 percent), and bone mass (usual range from 4 lbs.-8.5 lbs.). However, anyone that has any implanted medical devices should not use this scale since it can interfere with such things as pacemakers, metal plates, screws or even contraceptive devices so keep that in mind. For everyone else, this scale can be important as you age, especially for women, losing bone and muscle mass as a result of menopause. Using this product, you can keep a tab of how your body is doing in those departments before your next doctor’s appointment. Anyone on blood pressure medicine or antihistamines for instance that rid them of water will also find this scale wonderful. This scale can make sure your body is hydrated enough so you don’t run into a problem. If you want the perfect gift for Mother’s Day to express your love, then I highly recommend presenting Mom with this EatSmart Precision GetFit Digital Body Fat Bathroom Scale. Show her that you want her around for a long time and do pick this truly amazing scale up. The whole family can take advantage of better health with this one gift. This scale keeps tracks of up to seven different people so do keep this mind as well. Thanks to EatSmart Products, one lucky Nuts 4 Stuff reader in the continental United States wins an EatSmart Precision GetFit Digital Body Fat Bathroom Scale ($99.95 value)! 1. You must follow me on Google Friends Connect before any of your entries will count. If you already follow, then INCLUDE your ***EMAIL*** with name in a comment! 2. Go to EatSmart Products and tell me which product you would love to try also or something you learned from the site in another comment. This giveaway ends May 7, 2012 at 12 PM Eastern Standard Time. The winner will need to respond to my email with name and shipping address within 48-hours or another winner will be picked. I follow on GFCchestnutyouth(at)hotmail(dot)comI love their kitchen scale. I'm on a diet and would like to try the atSmart™ Precision Pro Digital Kitchen Scale to weight my portions. I think it would very helpful. I like the EatSmart Precision Retro Mechanical Kitchen Scale. I'm a folloewr via GFC. I would like the luggage scale. I would also like to try the Precision Pro Digital Kitchen Scale from Eat Smart Products. I would like to try the EatSmart™ Nutrition Pro Scale – Digital Food and Nutrient Calculator. I learned that all Eatsmart products come with a 2 year limited warranty. I tweeted the requested message on Twitter at https://twitter.com/#!/likwan/status/199490633554071554. I entered the InfraShine UL3 Blow Dryer giveaway. Entered the InfraShine UL3 Blow Dryer Giveaway.